Following Saturday’s thrilling night of fights, UFC president Dana White announced Lyoto Machida (Pictured) will get next crack at the light heavyweight crown. White put the top contender moniker up for grabs at “UFC on FOX 4.” MMA’s big boss left it up to Machida, Ryan Bader, Mauricio “Shogun” Rua and Brandon Vera to submit spectacular applications for the gig. Whoever posted the most vicious highlight reel finish would earn the nod. Although Shogun engaged in another thrilling war in the show’s featured attraction, White believed his TKO victory over Vera didn’t trump Machida’s vicious knockout win against Bader. Reigning light heavyweight king Jon Jones is set to defend his throne against Dan Henderson at UFC 151. He’s a whopping 7.5-to-1 odds-on favorite to retain his hardware. Jones choked “The Dragon” unconscious at UFC 140. 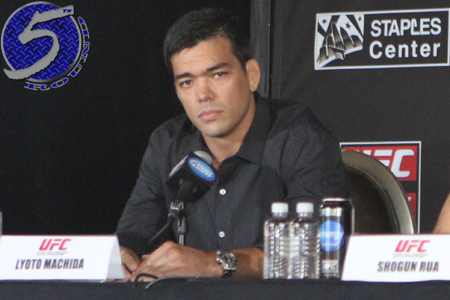 Henderson and Machida have never met.